When the Laurentian Glacier retreated northward 10,800 years ago, it scraped out a large trench. 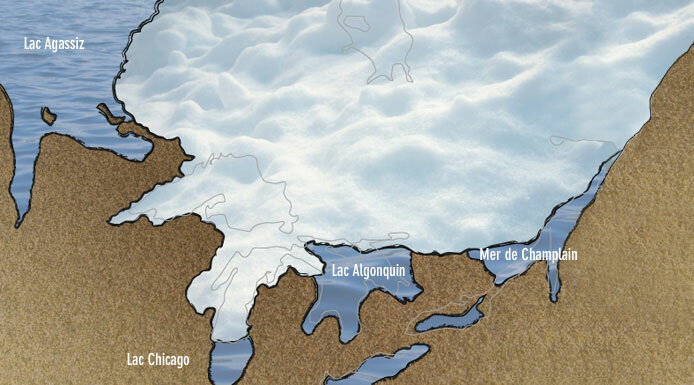 Since the bottom of this depression was below sea level, it filled with salt water and formed the Champlain Sea, a vast body of salt water that stretched from Ottawa to Quebec City. Released from the weight of the glacier, the Canadian Shield gradually began to rise. The salt water was replaced with fresh water from glacial run-off. Little by little, the Champlain Sea disappeared. It was replaced by the Great Lakes and the St. Lawrence River. In this period, Lampsilis Lake was formed. This lake was the ancestor of Lake Saint-Pierre; it had a surface area comparable to Lake Huron’s or Lake Erie’s. It stretched from Kingston, Ontario to Quebec City.